Lorrein is published by Sensalot in 2011. The Duces of Lorrein is a family game with a nice mix of existing and new game elements. It contains a new invented alternative to dice. 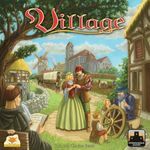 Goal of the game is to complete you mission card which states to build 4 specified workshops (Mill, Saw Mill, Stone Mill, Tannery (leather)). You start with just 1. Turn sequence: 1) Each player throws the chancebowl and gets raw materials (Wood, rock, animal, grain, lavender)(wooden pieces). 2)The raw material has to be processed in a workshop in order to become a useful product (product cards). Because the other players have the other workshops you'll have to negotiate with them to get you material processed. This makes players dependent of each other. With the product card a player can build a workshop, farm, castle, big castle or a witchery. 3)The final step is paying food for each castle. If a player doesn't have enough food, a game piece has to be taken away. The winner is the player that completes his turn and mission card. What makes the game interesting is the dilemma of being mutually dependent of your co player. Meanwhile each player wants to become independent by building your own workshops. For this you first need to negotiate with your co players. Becoming independent is often not on the road to completing you mission. So should you remain dependent and try to reach you goal asap, while running the risk of being blocked in the end, or should you try to become independent first and strong en your influence. Another element of influence in the game is the Mill. There is only one mill in the game. If someone else builds the mill, you lose it. Having the mill means controlling the food. You can use this position to get extra income or by starving and deterioration you opponents. Partner or Compete. Another element is the game of positioning: A workshop has to border a Castle. A small castle can have 2 workshops and a big castle can have 4 workshops. The castle has to be positioned between the 4 8-sided landscapes. Getting a good position with the correct landscapes around your castle is important. However, you opponents can block you by building farms, witchery or a workshop adjacent to your castle. As an extra the game contains two additions in the manual which will strongly change the game. The first addition is the option to steal a farm if it isn't protected by an own castle or witchery. The second addition is to steal workshop by building a stronger castle. All in all a very good balanced game, with a lot of dynamic and a great replayability.